It’s time to wave goodbye to last year and get ready for the new year ahead. This New Year, Pilot Pen has the perfect pen for list writing, goal setting, planning and school work to help you and the kids stay organised at home, school and work. “Writing to do lists and important dates down by hand can help with memory retention, so you’re less likely to forget,” Genevieve Matthews, mother of two and founder of Schools Coming – an online and printed educational resource to help parents organise the back to school routine. Genevieve says that writing goals and activities down in different colours can also help with remembering activities and staying organised. “Colour coding diaries and planners, for example green for sport, pink for parties, blue for medical appointments, can help keep you and yours on track.” she says. Pilot Pen’s FriXion range comes in a variety of colours and styles, making it a great choice for home and work. FriXion is made with thermo-sensitive ink and each pen features a built-in eraser so you can rub out date changes or mistakes and start again without a trace, keeping your planner or diary neat and easy to read. 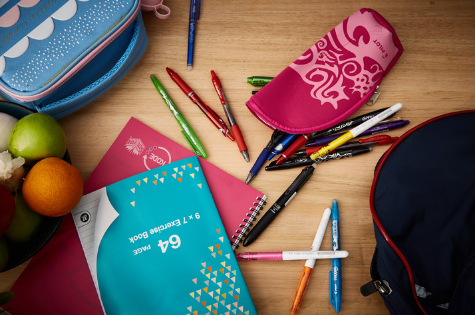 “Kids love FriXion because they can erase any mistakes to keep their schoolwork work neat and tidy and there are a variety of pen styles to choose from,” says Genevieve. “Make sure you also grab a set of refills for your FriXion Ball and Clicker (RRP $10.60 for a pack of three), so you can save money with refills and help reduce landfill, doing your bit for our environment by keeping your pen for longer,” said Mr Johnston, marketing manager, Pilot Pen Australia.